The United States' ongoing drone campaign in Pakistan is a violation of the South Asian nation's sovereignty, as it is being conducted without the consent of its elected representatives or that of the legitimate Government, a United Nations independent expert has warned. In a statement issued yesterday at the end of a three-day visit to Pakistan, where he inspected the impact of drone warfare on the local civilian population, the Special Rapporteur on human rights and counterterrorism, Ben Emmerson, reiterated Islamabad's condemnation of the use of drones over its territory and urged an end to what he described as "forcible military interference." "The position of the Government of Pakistan is quite clear. It does not consent to the use of drones by the United States on its territory and it considers this to be a violation of Pakistan's sovereignty and territorial integrity," Mr. Emmerson stated. "Pakistan has called on the US to cease its campaign immediately," he continued, adding that as a matter of international law, the US drone operations involve "the use of force on the territory of another State without its consent and is therefore a violation of Pakistan's sovereignty." 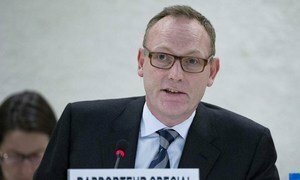 The UN expert also noted that Pakistan had been clear in expressing its fears that the drone campaign would ultimately be counter-productive, suggesting that it would further contribute to "radicalising a whole new generation, and thereby perpetuating the problem of terrorism in the region." Instead, Mr. Emmerson urged the international community to support the Pakistani Government in its attempts to implement a sustainable counter-terrorism strategy involving dialogue and development and reaching to the root causes of terrorism. "The people of Pakistan need to be given room to develop this strategy," he said, while pointing out that under the drone campaign, the Pashtun tribes residing in the targeted areas had already "suffered enormously" with their tribal structures "broken down" by numerous military operations. "It is time for the international community to heed the concerns of Pakistan and give the next democratically-elected Government of Pakistan the space, support and assistance it needs to deliver a lasting peace on its own territory without forcible military interference by other States." Special rapporteurs are appointed by the UN Human Rights Council to examine and report back on a country situation or a specific human rights theme. The positions are honorary and the experts are not UN staff, nor are they paid for their work. A United Nations independent expert today urged the Governments of the United States and the United Kingdom to release the findings of confidential inquiries into the detention and interrogation practices of the Central Intelligence Agency (CIA) during the administration of President George W. Bush.